A policy brief by Douglas N. Harris and Matthew F. Larsen examines the post-Katrina school reforms' long-term effects on a range of student outcomes. The New Orleans school reforms represent the first time in the last century that the traditional U.S. government-driven system of K-12 schooling has been completely replaced by a market-driven one. In 2005, in the wake of Hurricane Katrina, the state took over almost all of the city’s public schools from the local school district and then turned them over to non-profit organizations. These charter schools had autonomy over personnel decisions and almost all other matters and were held accountable to the state through performance-based contracts. Instead of assigning students to schools based on the neighborhoods they lived in, the new system allowed families to choose schools from across the city, and schools began receiving funding based almost entirely on the number of students they attracted. The reforms increased student achievement by 11-16 percentiles (depending on the subject and analysis method). The reforms increased the high school graduation rate by 3-9 percentage points. The reforms increased the college entry rate by 8-15 percentage points. The reforms increased the college persistence rate by 4-7 percentage points. The reforms increased the college graduation rate by 3-5 percentage points. 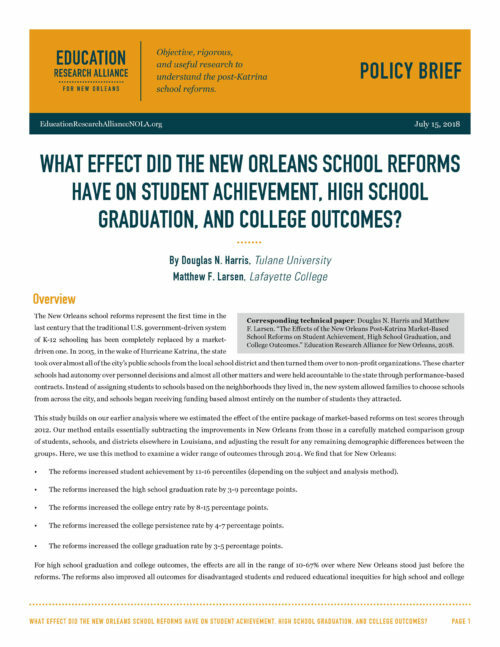 For high school graduation and college outcomes, the effects are all in the range of 10-67% over where New Orleans stood just before the reforms. The reforms also improved all outcomes for disadvantaged students and reduced educational inequities for high school and college measures. It is very unusual to see programs and policies improve all of these outcomes. We caution that these substantial effects are unlikely to arise in most other school districts because New Orleans had several advantages over other districts in making the reforms work. Nevertheless, the fact that New Orleans improved so much, in such a short period, on so many measures means that the city’s experiences are worthy of attention.